The requirement is to pass some custom fields collected on an order form, have the user pay via PayPal, and then pass those custom fields to an external script so that it can provision the service. 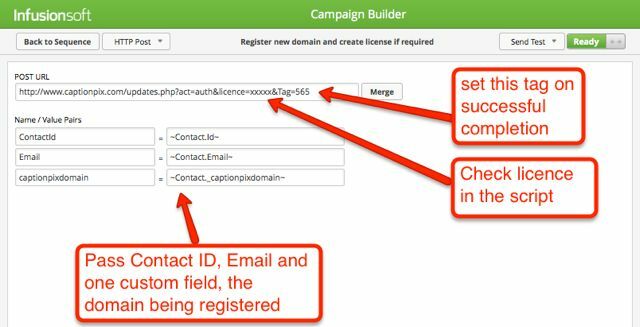 An external script is often required if you are not using Membership software such as iMember360 or CustomerHub that is tightly integrated with Infusionsoft using tags. An external script can be used to set up users on membership site such as WishlistMember, aMember, S2Member or maybe an external mobile service that is provisioned via an API. Typically the script will require user details (email, first name, last name, etc) and some service related information (service tier, membership level, etc). The former are standard Infusionsoft fields; the latter will be custom fields. With a credit card order, it is the same for steps 1 and 7-10: steps 2-6 and replaced by a single step where the the user fills in credit card details and pays and IS creates the order. So the interaction with the external script is identical however the buyer pays. These tips are based on increasing resilience and security of your external scripts that interact with Infusionsoft. The merged parameters are typically ContactId, Email, FirstName, LastName, plus any custom fields. The script saves the ContactId as the user key since the email address can change in the future. This will ensure any updates such as upgrades or downgrades get applied to the correct user even if their email address changes in the future. The script might do something like generate a password, create a membership record on WordPress, then write the username and password back to custom fields in Infusionsoft. The tag corresponds to a goal Product X Ordered completed in the campaign and can trigger further actions like the welcome email. It means that if the script fails then the order is not marked as completed and hence it is stuck as a open order which you can report on on your dashboard. You can then reprocess simply by restarting the campaign sequence.